Before there was all the ramen, food festivals and fine dining, there was meat on rice. From charsiu to siu yok to braised duck, this simple combination represents a staple-turned-addiction that has contributed to my ever-burgeoning muffin top. BBQ One in Eastwood is the closest I’ve had in Sydney to the favourites I grew up with, displaying their selection of meats on steel hooks in front of a glass window, beckoning to passers-by like hookers in the red light district of Amsterdam. The Roast Duck Rice consisted of a generous serving of rice and duck maryland with skin the shade of orange that you might mistake it for an oompa loompa. No need to adjust your television sets though, it’s perfectly normal. 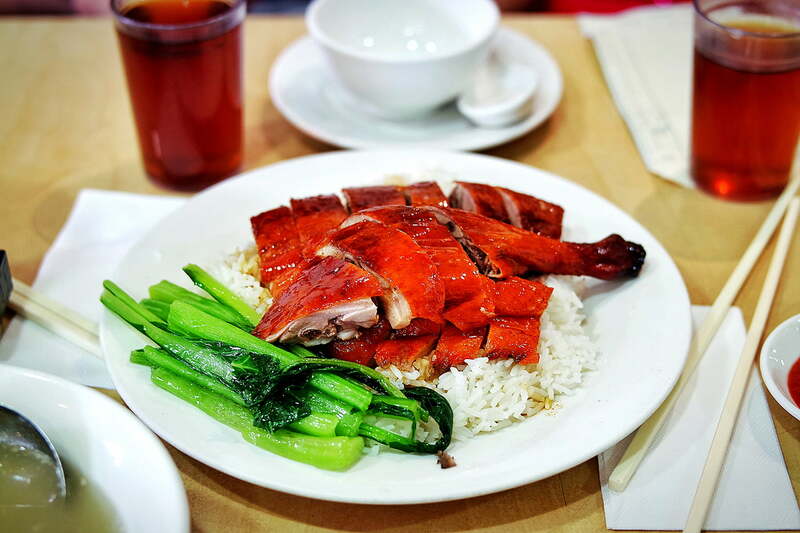 You can’t really go wrong with roast duck in my books, but what I really enjoyed was the lightly oiled rice drizzled with a soy based dressing, which I’m pretty sure contains some of the master stock used to braise some of the meat items on the menu. It’s like an absolute meat fest in there, and it’s amazing. For the more adventurous, I strongly recommend my usual order: a selection of braised offal on that same oiled rice. Pork stomach, tongue, ears and intestine are roughly chopped and laid over rice, drizzled with that same master stock dressing that comes with all the dishes. It may not sound pretty but if I could find the budget or the diet that allows me to have this every meal for every day of the week, I would. Pro tip: order a side of ginger and shallot sauce for an extra $0.50 – the amazing aromatics of the sauce augments all the savoury meaty flavours on the plate. The service is efficient and civil, and the portions are large enough to feed two moderately hungry people with one plate. It’s not a five-star date night place, but it’s a favourite with the locals for the super simple, quick, in-and-out sort of dining. Okay, so maybe it could be a date night place. The duck looks good, haven’t had any in a while!